The new Mt. Vernon with Efficient Energy (E2) technology is the most powerful and efficient stove ever designed by Quadra-Fire. E2 technology helps achieve 87% efficiency—saving money by burning less fuel. Plus E2 technology automatically adjusts the blower to maintain desired room temperatures. An 80lb hopper and easy-clean cast iron firepot reduce maintenance efforts. 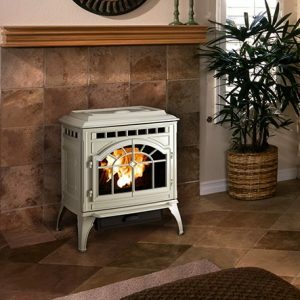 And these efficient pellet-burning stoves are the only product available with cast iron construction on all major components—proving it’s built to last.